It may be a bit over the top but I have changed my perfectly good genuine Land Rover tow bar for an after market alternative. There is a reason but only a few people will appreciate it. Off road the tow bar dramatically reduces the departure angle and acts as a drag anchor! It does however protect the back of the car from some damage. I need a tow bar from time to time. About two or three times a year it is used to tow a harrow round some paddocks and rarely to tow a tiny trailer. I wanted to have a tow bar so I looked round at what was available that might be less in the way when off-road. 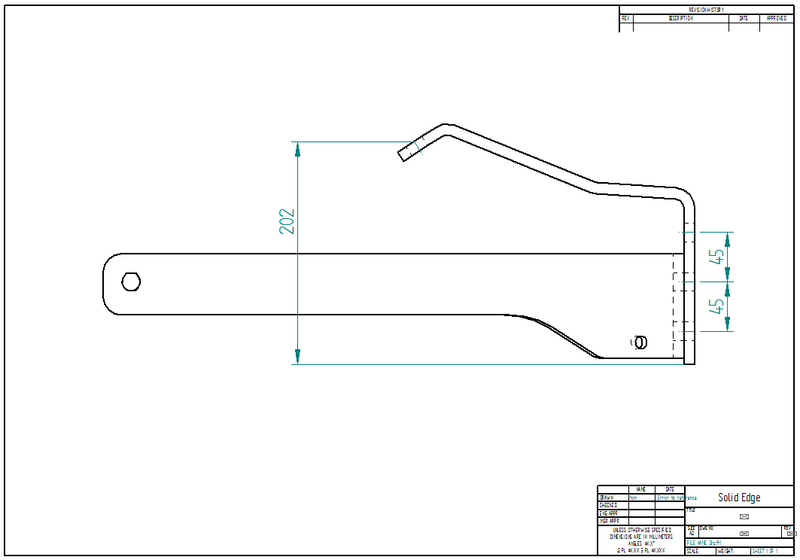 Being a 2004 car the tow bar has to be type approved to European Union directive 94/20/EC so I can't design or modify my own. The US type 2" receiver hitch is an excellent idea and they exist for the Discovery 2 but no one has type approved it for use in the EU! 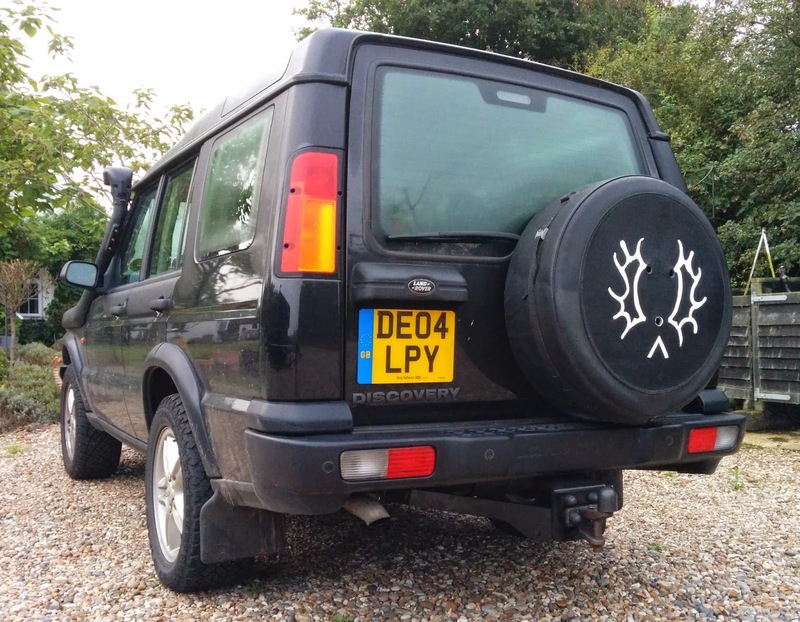 Nearly all the type approved designs for the Discovery are similar to the original Land Rover version. Mainly because the mounting points have to use the ones provided! 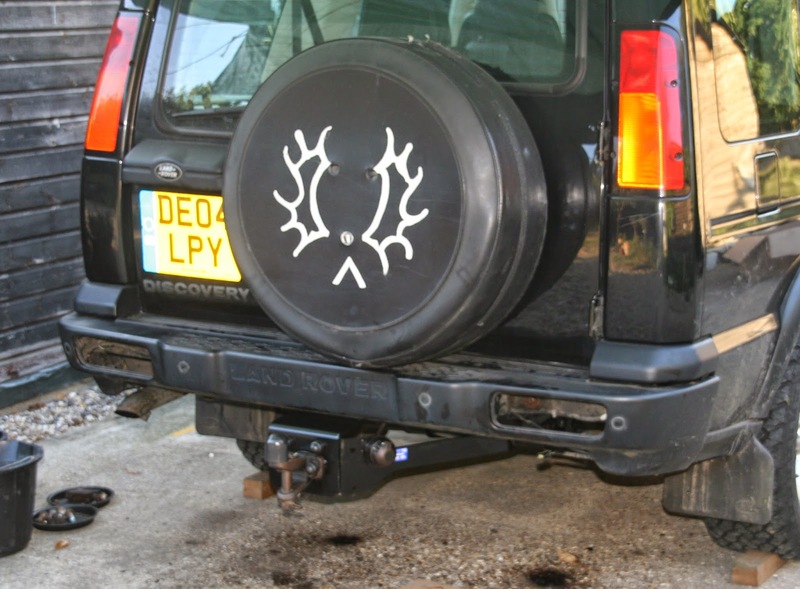 Luckily Tow-Trust's design uses a removable drop plate instead of the fixed plate used by Land Rover. It may only save 80mm but that is something. The fitting instructions show the shape of the metalwork. I fitted this on Sunday. 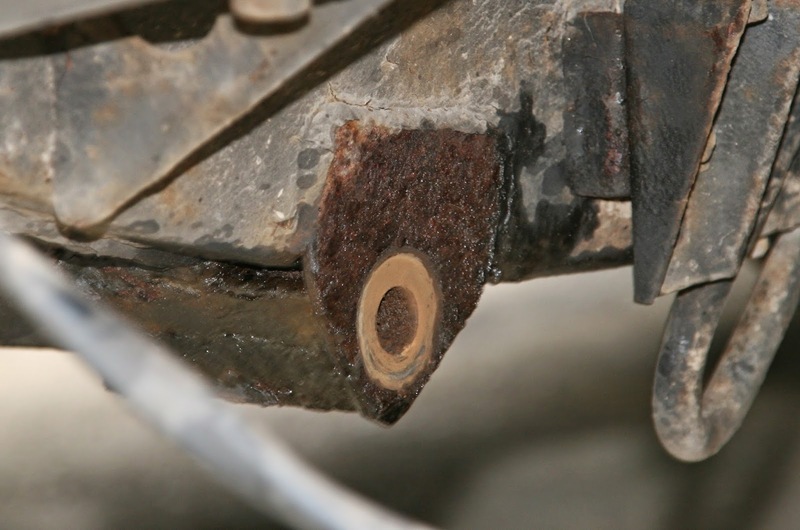 As is common with cars it is a very simple job made very difficult by rusted on bolts! It's not necessary to remove the rear bumper but it gave me easier access to the stubborn bolts and a tiny bit more space for leverage. The bumper is very easy to remove. 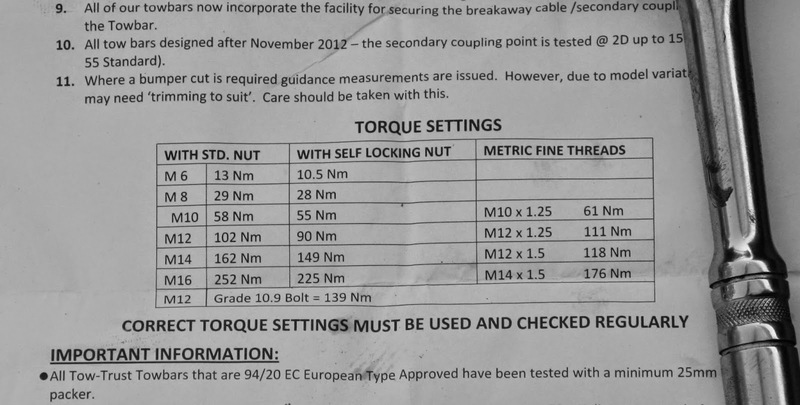 It is only two bolts and disconnect the lights. The rear lights are easy to remove from the bumper, just push in the metal clip from behind on the inside edge and push out. Once the lamps are out, unclip the wiring loom from the bumper either side. The wires are held up with a single plastic clip either side of the bumper, visible and easily reached from within the hole left after removing the lamp. The clip is just pinched together to pop it out. I have reversing sensors. That plug and socket need to be separated so the lead attached to the car is free. The socket remains attached to the bumper and the plug is attached to the, now free, lighting loom. Also removed through the holes left by the lamps are the short bolts holding on the bumper. One either side and mine came out with little effort. The bumper then just drops off. 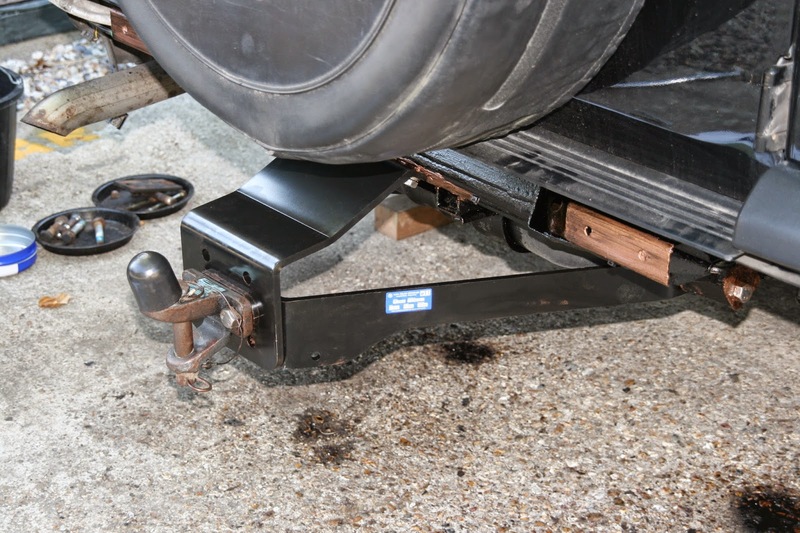 That leaves the rear free to access the tow bar and made it easy to remove the rusty rear step. Now it gets tricky. There are only 4 bolts to remove to get the tow bar off but you can guess the problem. After 10 years they don't want to come out. I did the usual stuff, starting with soaking them in penetrating oil and eventually ending with one needing to be angle ground off. The two in the middle at the top bolt in to two fixed threaded holes in the chassis. A long breaker bar loosened them. I left them loose while taking off the stubborn bolts at the end of the arms further back. 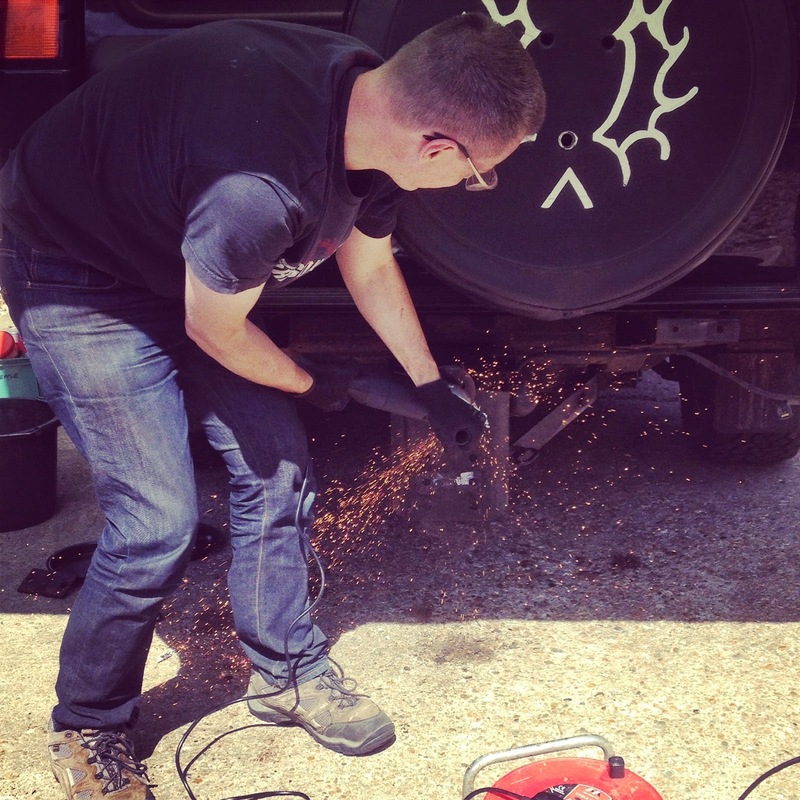 I can't give any extra tips because I broke an impact socket and, as I said, I finished with an angle grinder. I even needed an angle grinder to remove the bolt holding the electric socket bracket on. I wanted to re-use the stronger bracket. Unfortunately I did not know at that time that it would not fit the new tow bar! While I had the back of the car apart I took the opportunity to treat the chassis. I used Dinitrol ML inside the entire chassis sprayed in using an air line. When I changed to the black 4941 stuff for the outside the spray gun sprung a hole and stopped working! I did what I could reach with a brush. Assembly of the tow bar is fairly simple and just need to torque up the bolts to the specified values. I tend to go a bit overboard with copper grease to avoid bolts getting rusted in and in this case to stop the under-seal gluing the components together. I do spend a lot of time cleaning threads but that is a lot easier than angle grinding. A couple of bolts torqued up to 45Nm and the bumper is back on.